The 'Ladder' pattern is contained in the board packages 'Wood & Glass' for 10x10 and 12x12 Sudokus and in 'Stars with Signs of Zodiac' that are offered for download on the MaaTec Sudoku Boards page. Solution 30 medium Sudoku puzzles with 12x12 cells and cross pattern areas (26 KB). Solution 30 medium Sudoku puzzles with 12x12 cells and short & long pattern areas (26 KB). Solution 30 medium Sudoku puzzles with 12x12 cells and ladder pattern areas (26 KB). Solution 30 medium Sudoku puzzles with 12x12 cells and brickwall pattern areas (24 KB). Solution 30 easy Sudoku puzzles with 12x12 cells and cross pattern areas (28 KB). 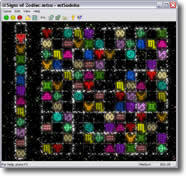 Solution 30 easy Sudoku puzzles with 12x12 cells and short & long pattern areas (29 KB). Solution 30 easy Sudoku puzzles with 12x12 cells and ladder pattern areas (28 KB). Solution 30 easy Sudoku puzzles with 12x12 cells and brickwall pattern areas (27 KB).